A tongue-in-cheek commentary on the Emergent Church Movement – by David Green. It’s titled “The Emergent Elijah”. A tad over the top, but fun. Elijah said to Ahab, “You have forsaken the commandments of the Lord, and you have followed Baal. Although I don’t agree with that decision, I can’t condemn it. After all, no one has all the truth. I understand that Israel has some truth and so does the religion of Baal. We’re all seekers of ultimate truth. Therefore, let us unite with the prophets of Baal. Now then send and gather to me all Israel at Mount Carmel, together with 450 prophets of Baal and 400 prophets of the Asherah, who eat at Jezebel’s table. And let us all have a conversation” (I Kings 18:18-19). So Ahab sent a message among all the sons of Israel, and brought the prophets together at Mount Carmel. And Elijah came near to all the people and said, “How long will we hesitate between two opinions? Forever, I say! The Lord might be God, or Baal might be God. We all have our own personal opinion as to who God is, but let’s face it: We might be wrong. So let us be open to Baal. Remember, Judge not lest ye be judged!” But the people did not answer him a word (I Kings 18:20-21). Then Elijah said to the people, “I alone am left a prophet of the Lord, but Baal’s prophets are 450 men. I’m not saying this proves that Baal is the true God, but it is a powerful argument for Baal, wouldn’t you agree? So let’s be open to what the prophets of Baal have to teach us.” (I Kings 18:22). “Now —- it, I know that some of you have proposed that we put Baal to the test and see if either Baal or Yahweh will give us a sign from heaven. But this is wrong. Even if fire came down from heaven, that wouldn’t prove anything. 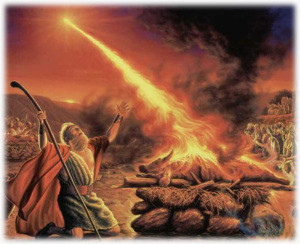 If we thought that fire proved that Yahweh was the true God, we would be arrogant. Our certainty would be based on evidence that could easily be explained by natural phenomenon. So instead of having the arrogance of certainty, let us instead have a humble conversation and unite in the unity of love with the prophets of Baal.” And all the people answered Elijah and said, “That is a good idea” (I Kings 18:23-24). So Elijah said to the prophets of Baal, “We respect your beliefs, prophets of Baal. We Israelites do not have absolute certainty about the God of Israel. In truth, we might be wrong. We’re only relatively certain that we’re onto something when we worship Yahweh. Therefore we don’t judge you when you call out to Baal or when you cut yourselves with swords and lances until blood gushes out. Additionally, we don’t believe that Yahweh is at war with Baal. God has not called his followers to gain victory or to triumph over his enemies. Yahweh does not want us to conquer the hearts of men through evangelism. “Conquest” is a trait of evil, white, European, male Christianity. We’re above and beyond such mean-spirited hurtfulness” (I Kings 18:25-29). Then Elijah said to all the people, “Come near to me.” So all the people came near to him. And he repaired the altar of the Lord, which had been torn down. And Elijah took the same number stones as there are world religions, and he said, “To the prophets of Baal and to all sincere worshipers of deities, we unite with you in true love and unity. The lion is lying down with the lamb. Amen?” (I Kings 18:30-39). Then Elijah said to the people, “Shake hands with the prophets of Baal. Hug them as your spiritual brothers”. So they hugged them; and Elijah brought them down to the brook Kishon, and made them members of his church. (I Kings 18:40).